Does anyone have any feedback on Aquiss FTTC? E.g. consistency of speeds. I'm considering putting an order in but would be nice to hear from any current customers..
Re: Feedback on Aquiss FTTC? I honestly can't rate them high enough. Speeds are insane and the package I chose is ideal for us (45GB per month 8am-8pm Mon-Fri, unlimited the rest of the time). Martin and his team do exactly as they say when they say and even try and help when it's out of their hands (BT!). All I can say is: Ditto!! I have absolutely no complaints with Aquiss and have received nothing but excellent service!! Seem to have a good reputation at this stage. As Aquiss are an Entanet reseller the quality of the service you receive is highly dependant on which interconnect node you are connected to, some are extremely congested during peak times. 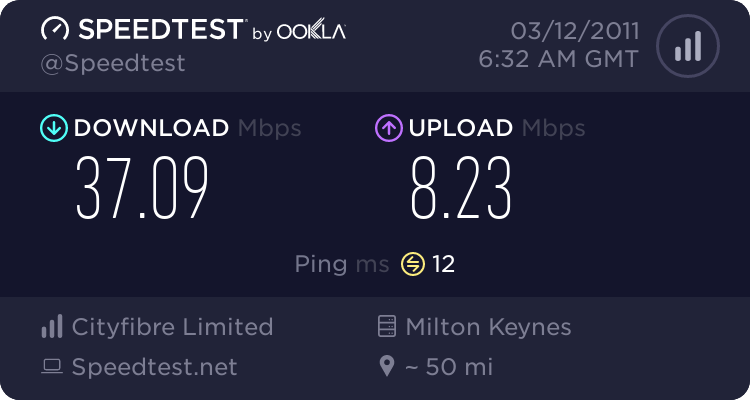 Ive just gone live with Aquiss today, good support, synched at 40mb/10mb exactly, had a few issues with slow speeds when first connected but Martin is helping as much as he can. Speeds are poor at the minute. I just got this via the BT Speedtester. For your connection, the acceptable range of speedsis 12000-38717 Kbps .